These developments should suggest that the selling was not “the beginning of the end,” but rather a step forward toward more “normal” market conditions. Market participants are adapting to a new rate regime and, we think, markets will ultimately continue to move higher (despite recent bouts of volatility) as investors focus on U.S. economic strength, with technological innovation continuing to lead the way among market opportunities. To continue reading the commentary, click here. Obviously, volatility has picked up from a historically low level. Some component of this is a function of “risk parity” portfolio construction models, where, as statistical risk falls across asset classes, portfolios are expanded in size/leverage. However, what we are seeing is that directional volatility in one asset class (bonds, starting in January) which has been consistently inversely correlated with stocks suddenly becomes very correlated with stocks as risk abatement in one asset class statistically forces risk abatement in others. Most of what’s going on out there are computers and algorithms “going off” in an aggressive fashion. On a more fundamental basis, I see the clear risk to the whole applecart is statistical inflation actually showing up. Why? An increase in 10-year yields, which broke out of the-sub 2.6% range (that they have occupied for the last 4.5 years) to the 2.7-2.8% range is not in and of itself a huge drag on the value of equities and is consistent with the higher global growth conditions that the stock market has been so elated by. At the margin, there may be some growth at any price valuations imperiled by a slightly higher discount rate, and bond proxies like utilities are easily the worst performers YTD and down 15% since November*. But if you run that thought a little deeper, what else does that signify? To me the risk is that Central Banks, see 2% inflation or something approximating this and begin packing up the quantitative easing (QE) and unconventional monetary policy ‘big top’ that has been parked in financial markets for almost 10 years now. Last week, investors shifted the focus from worrying about missing out on the ongoing rally to concerns that equities were overbought. There were a number of issues for investors to ponder, including an ongoing complicated political backdrop, earnings reports and economic news. The main focus, however, was on sharply rising bond yields, which rattled equity markets and caused a notable decline. The S&P 500 Index fell 3.8% for the week. Despite the magnitude of the decline, the drop was orderly and only took market values back to levels of a couple of weeks ago. Losses were broad-based, with relative outperformers including banks, airlines and telecommunications companies. A sharp rise in bond yields triggered the start of a corrective phase for stocks. We think yields are likely to continue rising, which could put additional pressure on equity markets. For equities, we expect more volatility over the short-term, a continuation of the bull market over the medium-term and generally lackluster returns over the long-term. Concerned that rising inflation and higher bond yields will lead to lower equity market valuations, investors are driving a sharp sell-off in stocks and a spike in volatility. But our work suggests their worries are getting well ahead of themselves. Historically, equity price-earning (P/E) multiples don’t start to compress until the 10-year Treasury yield hits 5%, its neutral point in a normal cycle. Given the lower-for-longer nature of this recovery, we think the neutral yield for this cycle is around 3.5%. Against that backdrop, a 10-year yield currently trading in the 2.75% to 2.85% range after the past week’s run-up is still well out of the danger zone. Remember, to decrease the likelihood of having to use extraordinary measures during the next downturn, the Fed’s main objective is to refill the quiver of monetary policy tools that it used to help pull us out of the 2008 crisis. This would suggest two or three hikes in the target funds rate in the year ahead. Possibly four, if global growth continues to accelerate, inflation expectations rise, productivity improves on the back of tax cuts and fiscal reforms, and sovereign yields abroad start to climb. All of this could push the neutral rate above our 3.5% estimate and could come without negatively impacting the economy and markets—an outcome the market hasn’t figured out yet, which is why we’ve seen downside pressure in the last several days. Frankly, we think it’s healthy to see some of the recent market froth blow off—January’s gains were unsustainable. The current equity sell-off has been triggered by fears of higher inflation and higher interest rates that have been exacerbated by investor complacency. We believe the selling is overdone and that the market can handle higher rates if the ascent is not too rapid. Long-term volatility measures suggest investors are willing to look past short-term price swings and focus on solid economic growth as a driver of equity performance. Treasury yields have been steadily rising since September and until late January, equity markets had been digesting this move with little trouble. However, a spike in interest rate volatility over the last two weeks, exacerbated by strong wage inflation data from the January jobs report, has led to the largest equity sell-off in two years. Average hourly earnings came in at 2.9%, the highest level since 2009, causing some to question if inflationary pressures are about to rise, and whether the Fed may be behind the curve. In our view, the market has overreacted to these events. We believe the real culprit behind the recent sell-off has been investor complacency. Prior to last week, the market had not seen consecutive daily declines for 310 days. Further, the record streak of days without a 5% correction was only broken yesterday. These types of streaks are rare and are typically followed by heightened volatility as fear begins to percolate back into investor minds. 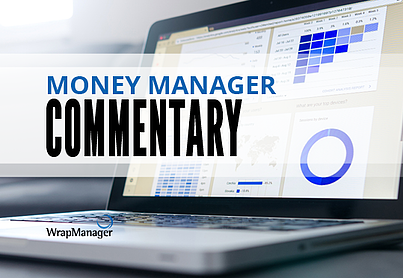 Have you been thinking about Money Manager performance this week? Did you know WrapManager can help walk you through extensive data and our position on strategies and how they’re poised for the current market environment? It’s easy to get started. Just go to our Money Manager Research Directory, choose which managers you would like to review, fill out the form and we will contact you to go through the information they’ve provided.